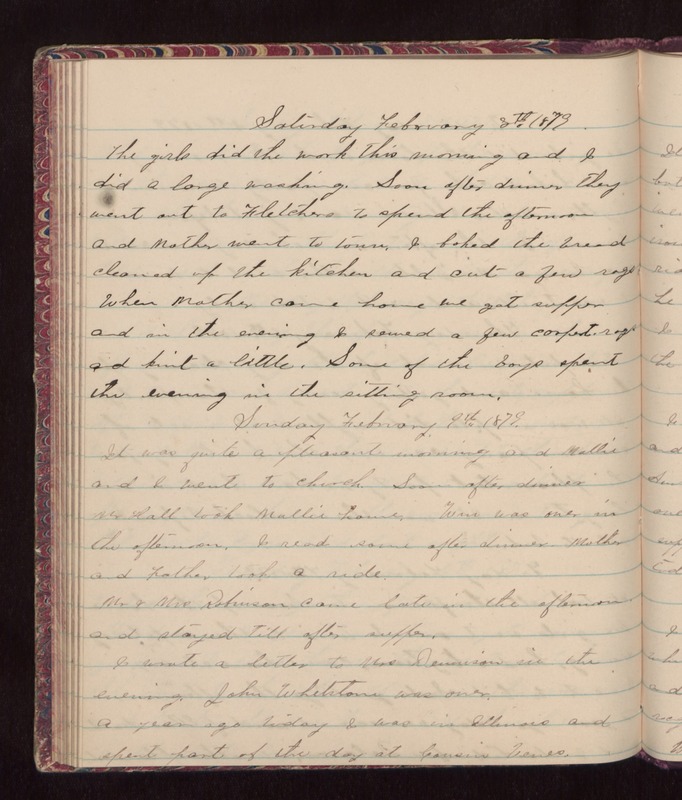 Saturday February 8th 1879 The girls did the work this morning and I did a large washing. Soon after dinner they went out to Fletchers to spend the afternoon and Mother went to town. I baked the bread, cleaned up the kitchen and cut a few rags When Mother came home we got supper and in the evening I sewed a few carpet rags and knit a little. Some of the boys spent the evening in the sitting room. Sunday February 9th 1879 It was quite a pleasant morning and Mother and I went to church. Soon after dinner Mr Hall took Mollie home. Win was over in the afternoon. I read some after dinner. Mother and Father took a ride. Mr & Mrs Robinson came later in the afternoon and stayed till after supper. I wrote a letter to Mrs Dennison in the evening. John Whetstone was over. A year ago today I was in Illinois and spent part of the day at Cousin Venes.